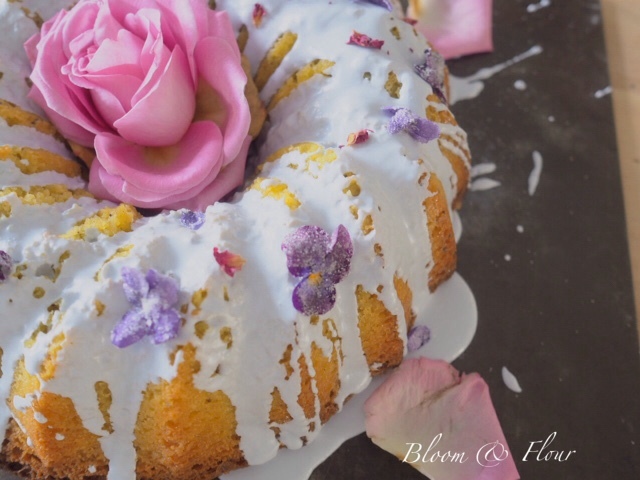 Lemon and violet bundt cake. 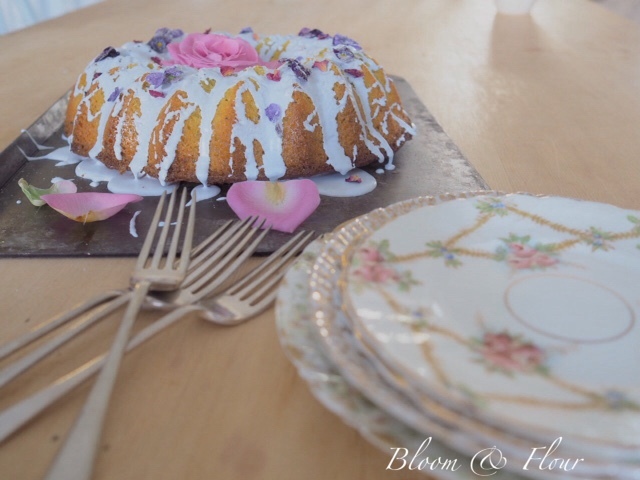 I spent yesterday experimenting with my new bundt tin, I've been pondering over which to buy for a while now. 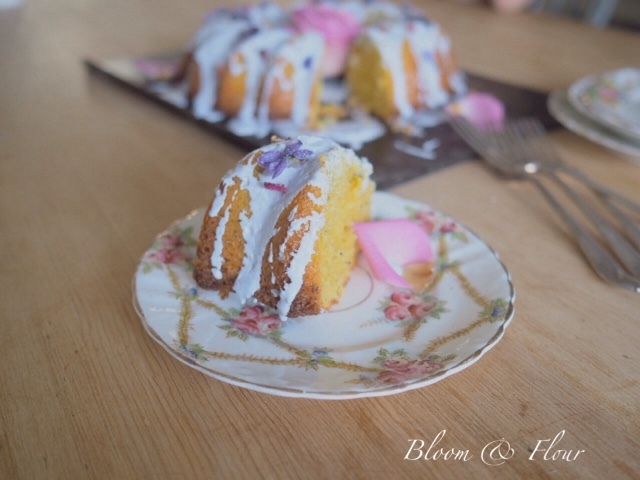 I wanted a beautiful old one, but heard so many horror stories about turning them out, so in the end I put aside how wonderful an old one would look in my photos, to how beautiful I wanted my finished cakes, and bought a rather splendid silicone one from my local cook shop in Ampthill. 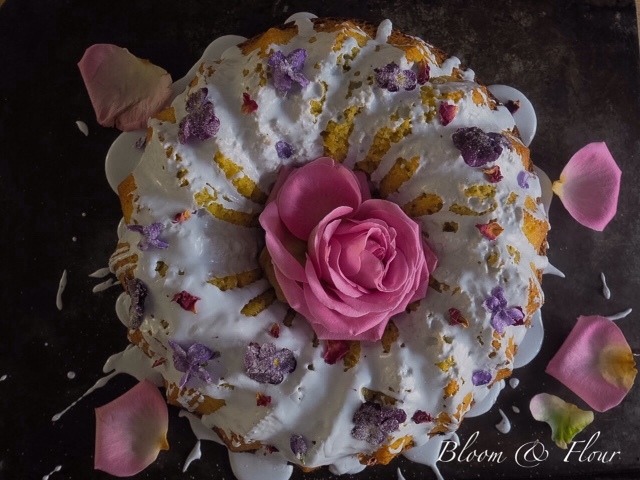 Firstly a light spray with a baking spray or a swish of melted butter over the whole inside of the mould, then pop into the fridge for 5-10 mins, this gives extra help of easing out the cake at the end. Secondly- I found my mould took a lot longer to conduct the heat than a tin, so by cooking it at a lower temp for slightly longer, and covering it lightly with a disc of baking paper (grease proof) helps to get a nice even bake. Now I'm going to write the method out with the ingredients so give it a read through first, then when you come to do it it should be easier! Set the oven to gas 4. Weigh 4 large eggs (shells on), then measure out the same quantity of butter (I like salted), and the same quantity again of caster sugar, cream these together. Grate in the zest of two lemons, a teaspoon of vanilla paste and a pinch of salt, mix well. Then weigh out 100g of ground almonds, whilst they are on the scales- top up with self raising flour to the weight of the eggs, add a pinch of salt and half tsp baking powder, a handful of poppy seeds, and mix together on the scales. Add one egg with a spoonful of the flour mix to stop it curdling and mix, repeat this until you have used all of the eggs then mix in the remaining flour mix. Add a teaspoon or two of milk to make the mixture silky. Pop into your bundt mould smoothing over the surface, cover with a disc of grease proof paper and put in the oven for 45 to 60 mins, after 45 mins take off the paper and press the top lightly, if it springs back its done, if not leave it for a bit longer, mine took 55mins, but all ovens vary. Leave aside to cool slightly then place a board on top and turn out ( this is where I hold my breath and cross everything). I think this is where the silicone mould came into its own as it was so easy to turn out. 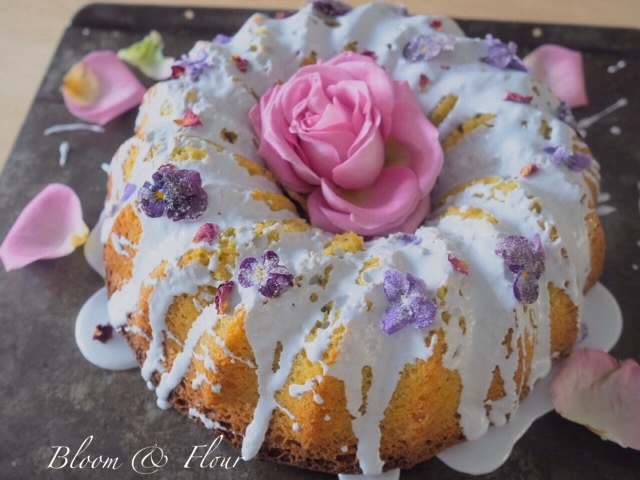 I used 1/4 of a packet of icing sugar, violet food colour (mix red and blue) and added lemon juice a little at a time whilst stirring, you want a nice smooth consistency that's drizzleable. 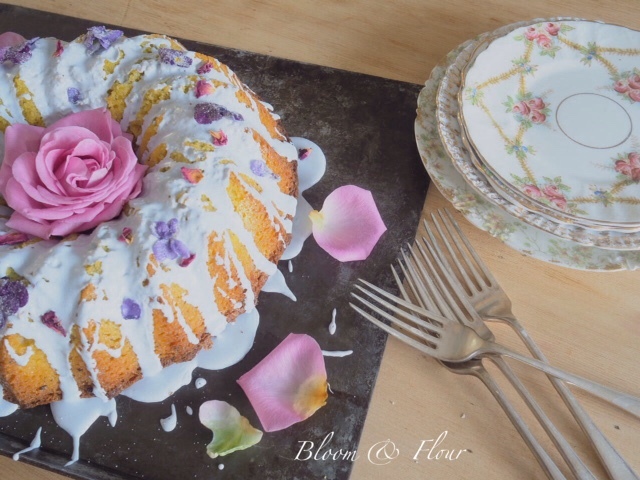 Drizzle over cooled cake then decorate with edible flowers. I crystallised some violets from my garden and I will do a post on these, but you can buy edible flowers ready to crystallise from Jan at Maddocks farm organics, check out her website www.maddocksfarmorganics.co.uk she also does bumble bee courses! Let me know if you give it a go! I'd love to hear how you got on!